What Do I Wear with a Navy Blazer? At some point or another everyone has heard about the importance of having a navy blazer in their wardrobe. Where this advice began, I really don’t know. Yet, many women, sight unseen, have added a navy blazer to their wardrobe just ’cause only to have it hang there because they don’t know what to do with it. Navy blazers fall into that “wardrobe essential” category, like pearls, a little black dress and a pair of sensible black pumps that many experts say we must have, yet fail to really tell us what to do with them once we buy them. Oh, and I want to set for the record, I own none of what’s on this supposed “wardrobe essential” list and I manage just fine. I will never be the style expert who should tell you must own something, and if I do I will at least tell you what to do with it once you buy it. Well, if you’re the proud owner of a navy blazer that has been collecting dust, or if you’ve been feeling the desire/pressure to own one but have no idea what to do with it once you buy it, here are some tips and looks on what to wear with a navy blazer. The first thing I want to say is, as far as color is concerned, you can wear a navy blazer with whatever color you want! Treat navy like black. Just like every color matches black, every color matches navy. Next, shape is crucial. Make sure it has some shape in the waist so it flatters your figure. I don’t recommend gold buttons only because I find them limiting. If you want to invest in one navy blazer, keep the buttons less blatant and more understated. A common look with a navy blazer is to pair it with a pair of khakis. With all the cool khaki styles out there, you don’t have to look like a yachting enthusiast to wear a navy blazer with a pair of khaki pants. In addition, funk it up a bit. Instead of going the traditional route, with such a neutral base of navy and khaki, add some fun color like a yellow t-shirt or a pair of orange wedges. If you don’t like those colors, choose whatever color you like to partner with this more classic base. With white jeans being so popular, a navy blazer is an easy piece to throw on and look polished. Again, with an all neutral base of white and navy, feel free to throw this look together with any color you like. In this case I went with pink which is such a pretty and feminine color to wear with navy. Keep in mind that the navy blazer you choose does not have to be classic. You can go for a style that is more cropped like this one. Worn with an bright purple skirt, basic white tank and a zing of yellow, this look is far from traditional or staid looking. Now, there is nothing wrong with wearing your navy blazer in a more classic manner. A pair of jeans and a navy blazer is about as classic as you can get. However, don’t stop there. Up the ante and add some punch with color. 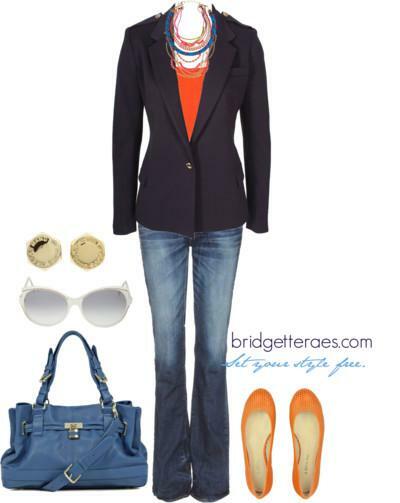 In this case, the blazing orange shade and tonal blue bag along with a colorful necklace, that pulls it all together, looks classic with a twist. Grey and navy go together like peanut butter and jelly. Remember, however, that this color combination doesn’t have to be boring. Throw off the traditional look of the navy blazer with a piece that is a bit funkier, like the skirt of this dress. Plus, topped with yellow, the look is updated even further. If you want a more tailored and structured look for a soft summer dress you own, instead of a cardigan, a navy blazer is a great accent piece. 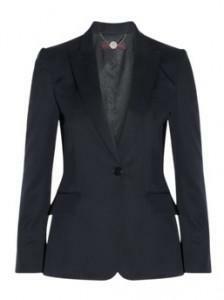 In this case, I chose a navy blazer with 3/4 sleeves that was structured but still feminine.